Over time, businesses have managed core HR processes in separate modules, disparate systems, or even through spreadsheets. Businesses that are scaling rapidly have to think about cost, time and risk involved in manual approaches and data silos. NetSuite’s recent enhancement to employee management helps people with information that is actionable throughout the organization from a single suite. SuitePeople Core HR Videos – The help center has a video section that can access SuitePeople’s core HR videos. With this version release, you can view time-off request and review workflow videos. Time-Off Management and Timesheet Integration – In the new release, when a time-off type request is created, it can be associated with project and project task. On approval, the project associated time-off type is reflected on time entries and weekly timesheets. Search can be based on Time-Off Type, Project, and Project Task fields. Time-Off Expiry Notifications in the Employee Center – Employees can now see time-off expirations in the employee center. For instance, if employees have time off that expires at the end of May, they start to see the expiry notification in April. Corporate Card Expenses - In NetSuite 2018.2, expense lines can now be marked as paid by a corporate credit card, on expense reports. This is a great addition in the new release, as it overcomes the challenge of having to reconcile expenses manually using journal entries. Time Tracking Enhancements – While in the earlier version, records had to be opened to be edited for approvals - in the new version, inline editing is available. Weekly Timesheets now support Time-Off Management as well. When time-off is approved, the Time-off field on time transactions is populated with a link to the time-off record. Expense Report Enhancements - Previously, custom approval workflows did not support saving of an expense report for later. 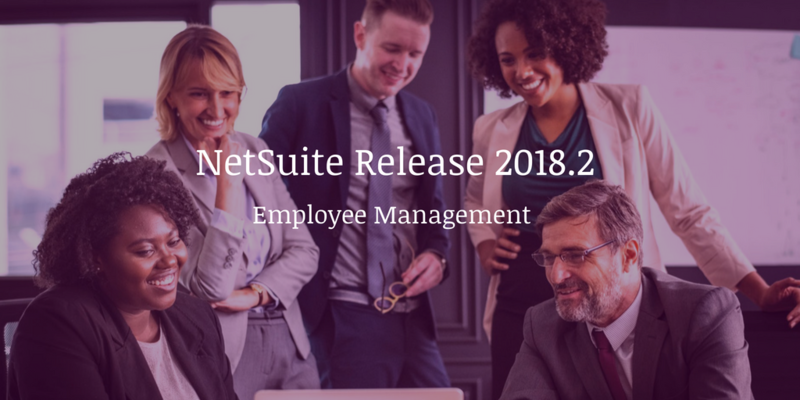 In NetSuite 2018.2, one can enable employees to save an expense report without submitting it for approval. You can also choose to turn off warning messages for taxable expense lines without receipts. Expense Details Search Enhancements – In the new version, the expense report search results can be seen with individual line items, [without disabling the Combine Detail Items on Expense Reports preference]. In the earlier version, if ‘combine detail items’ was enabled, it also grouped expense items in the search results. Associating Deductions and Earnings Payroll Item Types with Additional Accounts – Certain payroll items can be associated with additional account types. Deduction payroll items can be associated with an expense or a liability account and Earnings payroll items can be associated with a liability or an expense account. -Employees can now request time off, access employee directories and organizational charts, monitor upcoming vacation schedules and new hires. -Managers and HR professionals are able to streamline employee information, new hires, employee onboarding, promotions and compensation changes. -And all this from a single suite.